An alternative to the state classes has been introduced in v1.2 of GC FSM. 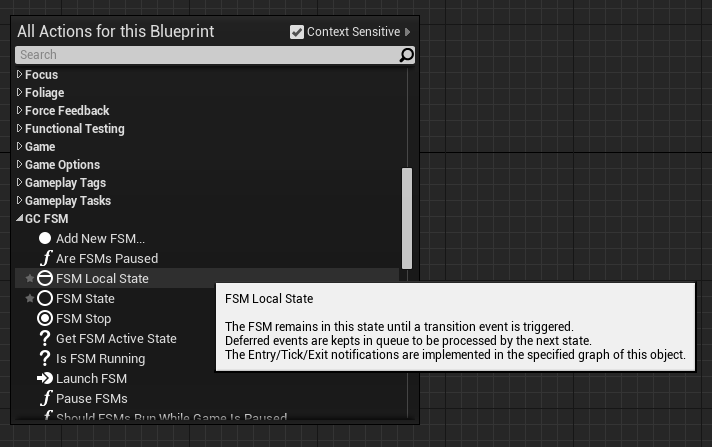 Instead of creating a separate class, you can have handle the state logic right in the event graph of the object running the FSM. 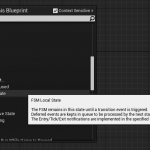 In order to create an FSM Local State, right-click on the background of the event graph and select “FSM Local State” from the GC FSM category. You can immediately edit the name of the state. 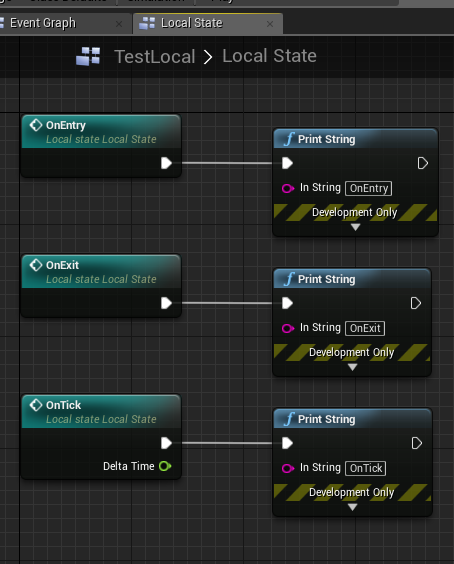 The logic of a local state is limited to the OnEnter, OnTick and OnExit notifications. All three entry points have to be defined in a separate event graph page. In order to create a suitable page, just double-click on the local state node. GC FSM will automatically create a page with the three entry points, initially disabled. If you want to re-use an existing graph, you can just select it in the combo box on the local state node. You can rename a local state graph at any moment, the node will be automatically updated. If you delete the graph, the node will be invalidated. Once an FSM local state node is assigned a graph, double clicking on the node will open the specified graph. The new graph is opened in the same editor tab, therefore replacing the current tab. 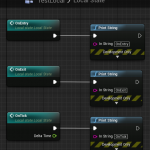 This is a deliberate design choice of the Unreal editor and cannot be changed by GC FSM. If your mouse has a thumb button, you can get back to previous graph by pressing it. You can force the editor to open the graph in a new tab by pressing Shift while double-clicking the node. When a local state is entered, the OnEnter handler is looked up in the specified graph and is executed. From then on, the OnTick handler, is executed every tick. When the state is exited, the OnExit handler is executed. Notice that all these handler are called on the object that runs the FSM. This means that the local state handlers have complete access to all variables of the object. Since local state handlers are called on the object that runs the FSM, launching an FSM from such handlers will launch the new FSM on that object. This new FSM is therefore at the same “level” as the original FSM and not a nested sub-FSM. If two different FSMs on the same object enters two local states implemented by the same graph at the same time, you may get unexpected results. Don’t do that!